LGBTQ+ Comfort Reads: Heartstopper by Alice Oseman, reviewed by Lucy Pettigrew - Words Matter. On February 7th 2019 Alice Oseman published her first graphic novel and first part of her popular young adult webcomic Heartstopper: Volume One. The webcomic has over 50,000 subscribers online, and is also available as an ebook and in traditional print format. I’m not someone who usually picks up a graphic novel or comic over a young adult novel or a modern poetry collection, but this stunning graphic novel blew me away and I can’t wait to pick up the next volume in the series when it comes out – it’s also made me want to read more graphic novels! I will read anything Oseman publishes (it could be a book filled with the word ‘potato’ and I’d still love it). 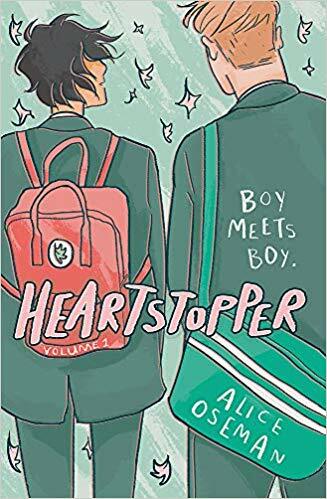 Heartstopper is a young adult comic that stars Nick and Charlie, who are both trying to navigate life as teenagers in an all-boys grammer school in the United Kingdom. Oseman describes it as an “LGBTQ+ webcomic” as almost all of the characters are part of the community. The plot of the story is stunning and heart-warming – I quickly became attached to the characters and got so invested that I didn’t put it down in between starting and finishing it. The story combined with the cute art style was a perfect combination and even though it was sad in some parts I still smiled the whole way through because of how utterly enticing it was and how well the story was told. I couldn’t get enough of the representation either – there were so many characters that were part of the LGBTQ+ community and it felt good to have that representation handled in such a well-written way. All of Oseman’s books so far (which you should also read, they’re fantastic and showcase her talent even more!) have also included LGBTQ+ characters so I was glad that this trend continued in Heartstopper. Overall, this graphic novel was the perfect read. It was easy to follow and combined with the plotline, art style and representation it made for a really enjoyable experience. Don’t hesitate to pick it up next time you’re in a book shop (or you can get it online!). Heartstopper is published by Hodder Children’s Books. Check out the LGBTQ+ children and YA collection in our Schools Section of the library.